Course Duration: M.Phil. (English) is 2 Years. Duration Course Duration of M.Phil. (English) is 2 Years. Subjects Required Subjects corresponding to Post-graduate studies. Similar Options of Study M.Phil (Commerce), M.Phil (Economics), M.Phil (Mathematics), M.Phil (Tamil) etc. Employment Roles Assistant Professor, Lecturer, Teacher, Principal, Research Scientist, Psychologist, High School Teacher, Content Writer, Editor, Translator, Copywriter, Author, Columnist, Home Tutor etc. Placement Opportunities Schools, Colleges, Research Centres, MNCs, NGOs, Translation Firms, Publishing Houses etc. 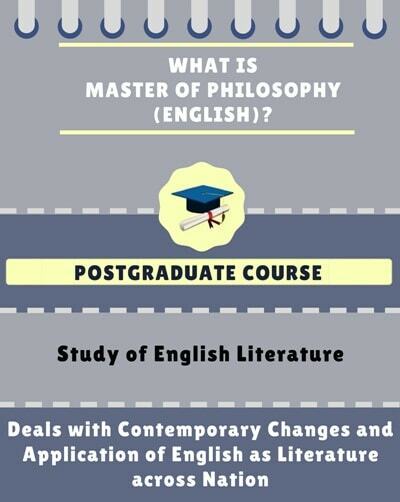 M.Phil English Literature or Master of Philosophy in English Literature is a postgraduate English course. English literature is the literature written in the English language, including literature composed in English by writers not necessarily from England. Example of famous authors and poets like Robert Burns was Scottish, James Joyce was Irish, Joseph Conrad was born in Poland, Dylan Thomas Was Welsh, Edgar Allan Poe was American. In other words, English literature is as diverse as the varieties and dialects of English language spoken around the world. In academia, the term often labels departments and programmes practising English studies in secondary and tertiary educational systems. Despite the variety of authors of English literature, the works of William Shakespeare remain paramount throughout the English-speaking world. M.Phil (English Literature) is an important and job oriented course throughout India. The admission procedure for the course is to qualify the individual entrance exams conducted by the University/Colleges in accordance with the admission procedure. 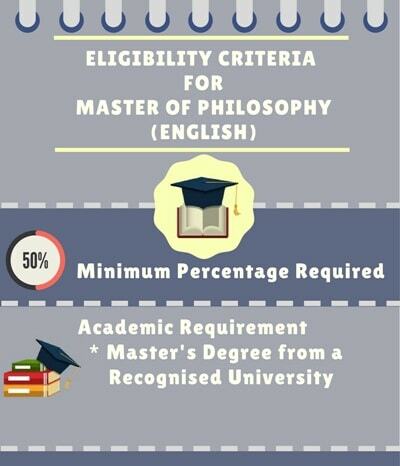 What is Master of Philosophy [M.Phil] (English)? It's a two-year course which will mostly deal with the contemporary changes and application of English as Literature across the nation. Eligibility criteria for the course is to complete the (10+2) Secondary and Higher Secondary with English as Compulsory subject and 50% marks as the minimum percentage. This course will offer readings in literary texts written in the period 1660-1789. It will examine how literary writing positions itself with respect to the larger events of eastern Europe's encounter with modernity. This course will introduce students to the various aspects of the movement called Modernism. It will examine different texts of the movement, preferably from diverse genres and different European languages. 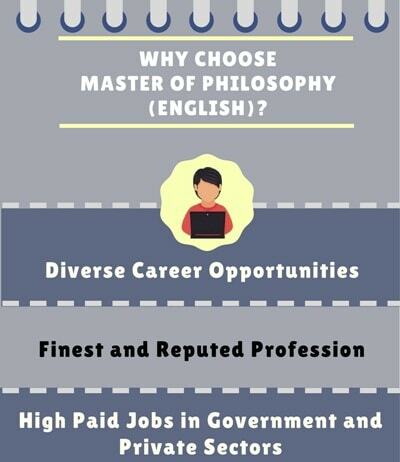 Why Choose Master of Philosophy [M.Phil] (English)? M.Phil, the degree is beneficial as the students can get jobs as proofreaders, Copy Editors, Copywriters, and writers in the marketing department (e.g. writing pamphlets or brochures for social service firms like PETA) etc. Another benefit is that students can also opt for research work abroad. But to get jobs abroad, work experience is a must. Apart from teaching field, postgraduates of English Literature can start a career as consultants or they can join with publishing houses. With experience, candidates can get jobs with national as well as international magazines such as Vogue, National Geographic Magazine etc. Therefore it multi-beneficial for them. Candidate’s with a minimum of 55% aggregate marks in MA (English) examination or an equivalent examination from a recognized University shall be eligible, to apply for the course. For admission, the candidates shall be required to take a written test followed by an interview. 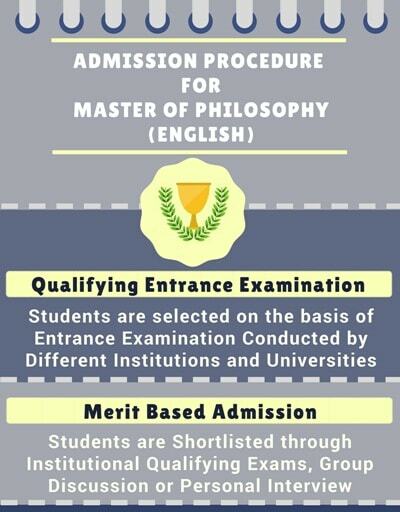 Admission to M.Phil in English Literature is through an entrance examination. The application forms for M.Phil courses are generally available in the month of May. However, Many universities follow the fall and winter cycle of admission in the program. The examination is mostly subjective in nature and is designed to assess a candidate’s analytical and critical thinking abilities. The test paper ideally contains three to five questions out of which a student has to attempt 2 to 3 questions depending upon the directive of the university. Maximum marks vary from 70 to 100. The questions are asked from topics related to literary criticism and literary analysis of passages, poems, or a set of work. The purpose of these questions is to test a candidate’s aptitude in doing research and their prior knowledge in the field of literature. It also tests their ability to apply literary theory and criticism techniques to literary works. To qualify in the entrance test, an aspiring candidate ought to have an in-depth knowledge of literary works, authors, genres, literary periods, and historical movements in literature. Also, a candidate needs to have applicable knowledge of literary theories. A student must go through works of prominent literary figures of all eras and have some prior experience of analysing their works.